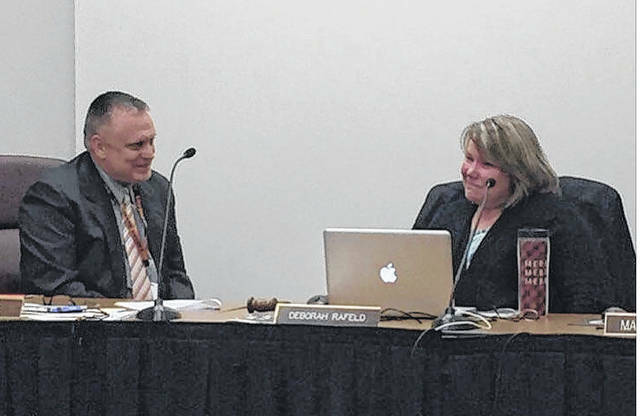 Outgoing Delaware City Schools board of education member Deb Rafeld, right, talks with Superintendent Paul Craft at her last board meeting on Dec. 11. When the ball drops on Sunday, it will mark the beginning of 2018 as well as the end of the term for Delaware City Schools Board of Education President Deb Rafeld, who has been a board member for 12 years. Rafeld said she was substitute teaching for the district more than a decade ago when she got the idea to run for a vacant board of education seat. Rafeld won her seat in 2006 and has been on the board ever since. She said she’s thankful for the Delaware community’s support. Rafeld said being on the board has taught her much and has changed her life. Rafeld now teaches fifth grade in the Buckeye Valley Local School District. Rafeld’s seat became vacant in November after she decided not to pursue a fourth term. Rafeld said the board members she worked with felt like family and respected each other, even when they disagreed about issues. “I will miss the people the most,” Rafeld said. “Everyone within the district is great. The leadership are wonderful people. I am going to miss everybody a lot. Craft said Rafeld was connected to various sports teams and other groups through her kids and those connections were invaluable to the board. Rafeld’s seat was won by Michael Wiener, an assistant prosecutor at the Crawford County Prosecutor’s Office, during the election on Nov. 7. Wiener will begin his term in the new year.